India is a country that will either completely sweep you off your feet or make you trip over your feet. 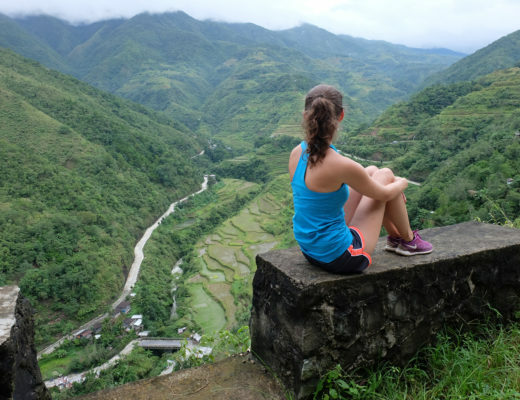 It’s an overwhelming country that will awaken senses inside of you that you didn’t even know you had. 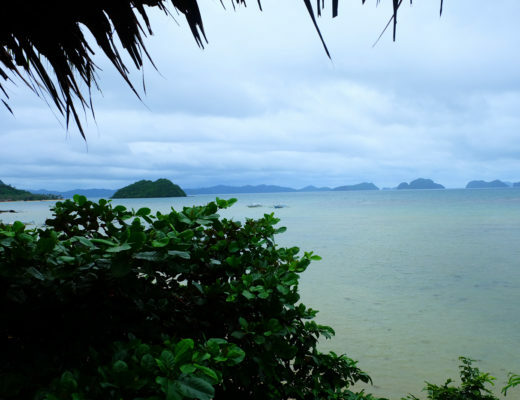 However, if you can embrace that, visiting can be one of the most invigorating experiences you ever have abroad. India is a big country with extreme diversity. You can visit the chaos of the busy cities like Delhi and Mumbai, you can visit the picturesque landscapes in the Himalayan mountains or you can hit up the beautiful beaches on the Indian Ocean. 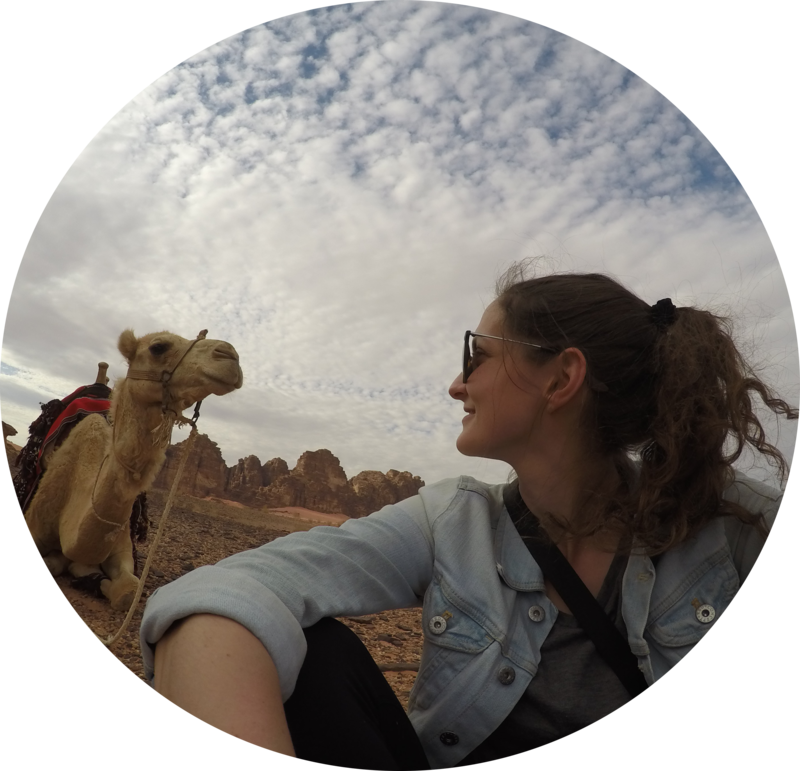 There really is so many different itineraries you can plan to suit every travelers needs when it comes to India, however, since I’ve only traveled to North India so far in my travels I wanted to focus my sample itinerary for you on that. Since you’ll likely fly into the Indira Gandhi International Airport in Delhi, the capital of India, this is where you’ll kick start your trip. Delhi is a massive city that is home to over 24 million people, making it the second most populous city in the world next to Tokyo, Japan. Delhi is the largest commercial centre in Northern India and is the 11th worst city in the world for pollution due to the amount of vehicles and nearby factories. Sounds great doesn’t it? Insert sarcasm here. 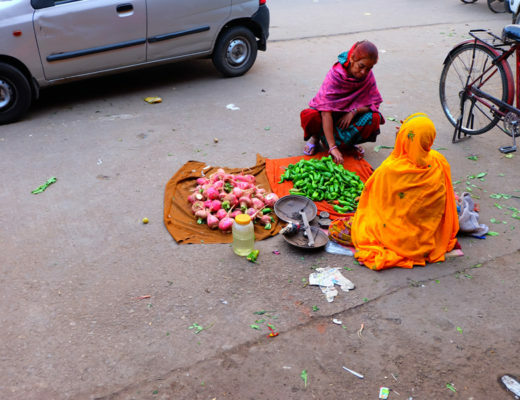 Although these facts can seem less than appealing for travelers, you can’t come to Northern India and not see some of Delhi because it’s truly unlike anywhere you’ve probably ever been, plus there’s lots to do! 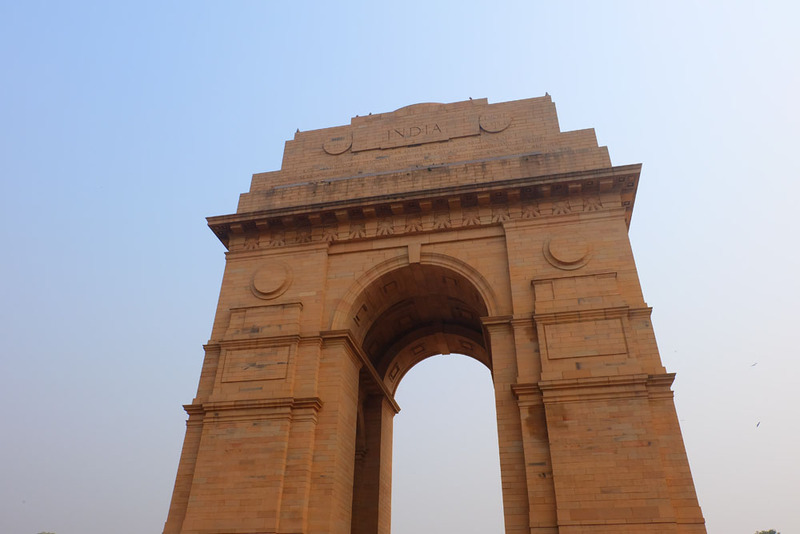 India Gate: A war memorial located in New Delhi that memorializes 82,000 soldiers who died between 1914-1921. You can find 13,300 names inscribed on the gate. Agarasenki Baoli: A large and gorgeous step well located on Hailey Road in New Delhi. 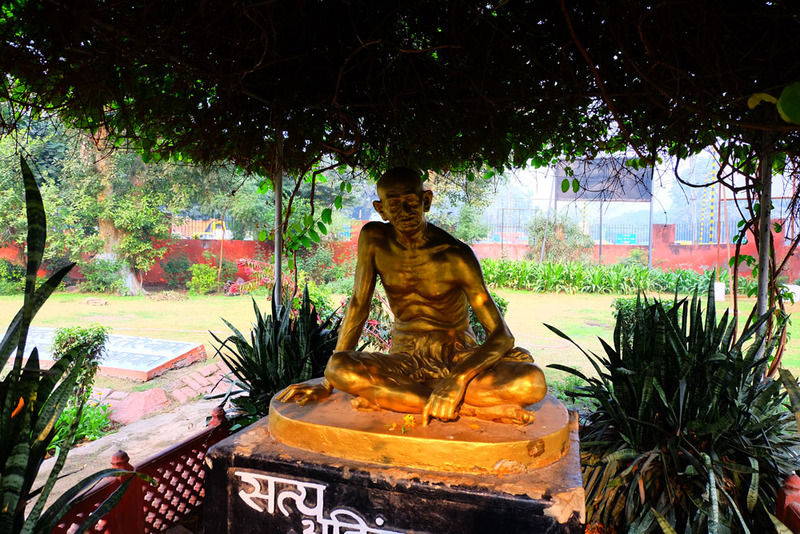 National Gandhi Museum: Showcases the life and principles of Mahatma Gandhi. Red Fort: A historical fort which was the main residence of the emperors of the Mughal dynasty for almost 200 years (until 1857), located in the centre of Delhi. Chandni Chowk: Located near the Red Fort this market is one of the oldest and busiest in Delhi. Humayun’s Tomb: Tomb of the Mughal Emperor Humayun which was commissioned by his wife in 1569-1570. The complex is absolutely stunning. Bahai Temple (Lotus Temple): Notable for its flower-like shape, the Bahai Temple is open to all religions and is composed of 27 free-standing marble petals. Purana Quila (Old Fort): One of the oldest forts in Delhi. Check out my two day itinerary for more details on how to spend two days in Delhi. Next head from Delhi to Jaipur. There are a few ways you can reach this destination. First off you can fly non-stop very inexpensively (starting at $25 USD) or you can take a train for about $15 USD or bus for under $10 USD. If you are riding the train, ensure that you select the right class of car you’d like as sitting in an unairconditioned, overcrowded car for almost five hours can be your worst nightmare. Jaipur is the capital of the state of Rajasthan and was one of my favourite cities I visited in India. The city is much smaller than Delhi with a population of around 3.1 million and forms part of the popular tourist circuit called the “Golden Triangle”. The city itself was founded in 1726 by Maharaja Jai Singh II the ruler of Amer which the city is named after. During the rule of Sawai Ram Singh, the city was painted pink to welcome the Prince of Wales and later Edward VII in 1876. This is part of what makes this city so magical as even today many of the streets are lined with pink buildings which is where it gets its nickname the “Pink City”. What to do in Jaipur? There’s lots! 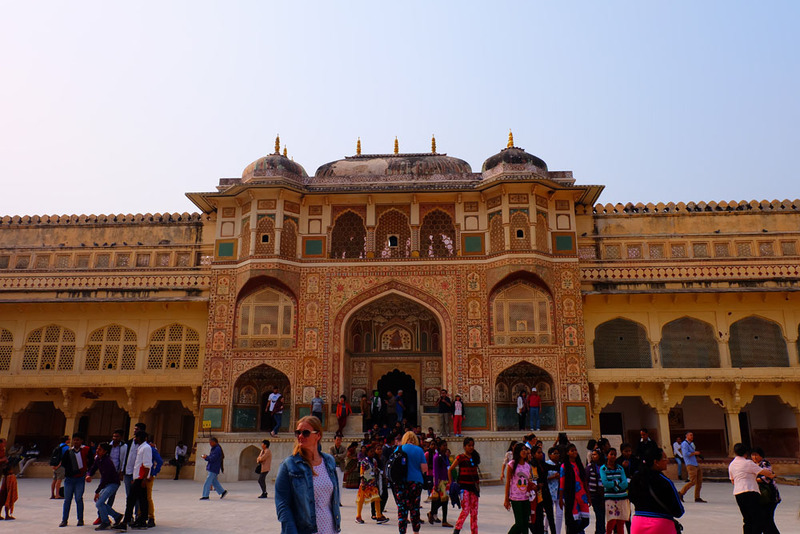 Amber Fort: Located about 11km from Jaipur city but worth the drive. Amber Fort is a gorgeous fort located high on a hill and is the primary attraction of the area. Originally built in 1592. IMPORTANT!! Do not take an elephant ride up to the fort. These elephants are treated inhumanly and you’re supporting a business of animal abuse! City Palace: Located in the city centre, City Palace is a gorgeous pink palace that takes up a large area of the old city of Jaipur. 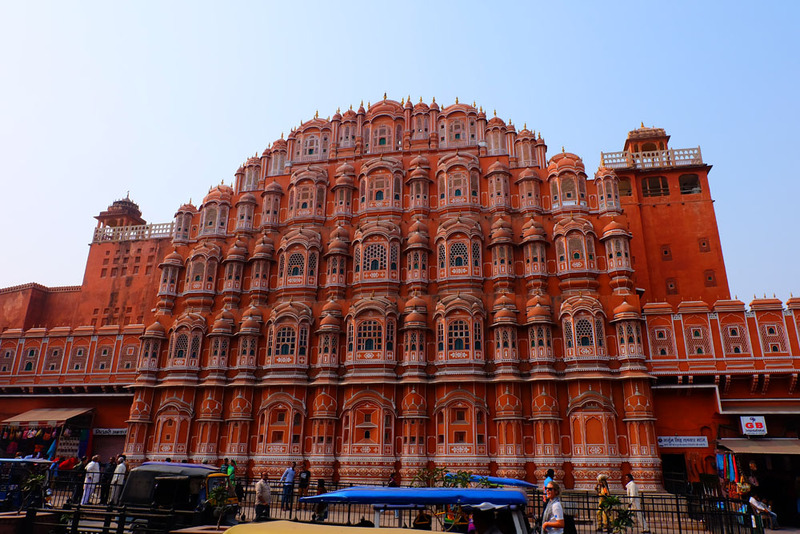 Hawa Mahal: Absolutely stunning red and pink sandstone palace which was originally build for the women of the royal household to observe festivals while remaining unseen. Jantar Mantar: A collection of 19 architectural astronomical instruments built in 1734 CE and includes the world’s largest sundial. Hot air balloon ride: This can be a great way to see the beautiful city of Jaipur from above and fly over the forts and palaces of the Pink City. See a movie: See a traditional bollywood flick in the amazing Raj Mandir Cinema. If you’re looking for a place to stay, Bissau Palace is an incredibly beautiful hotel and unique experience. It’s time to leave the Pink City and head to Agra. You can take a train to Agra which takes just under four hours and cost around $11-$16 USD. Agra is located in the northern state of Uttar Pradesh and is one of the most populous cities in that state. Agra attracts tourists daily as it’s home to one of India’s most notable landmarks, the Taj Mahal. 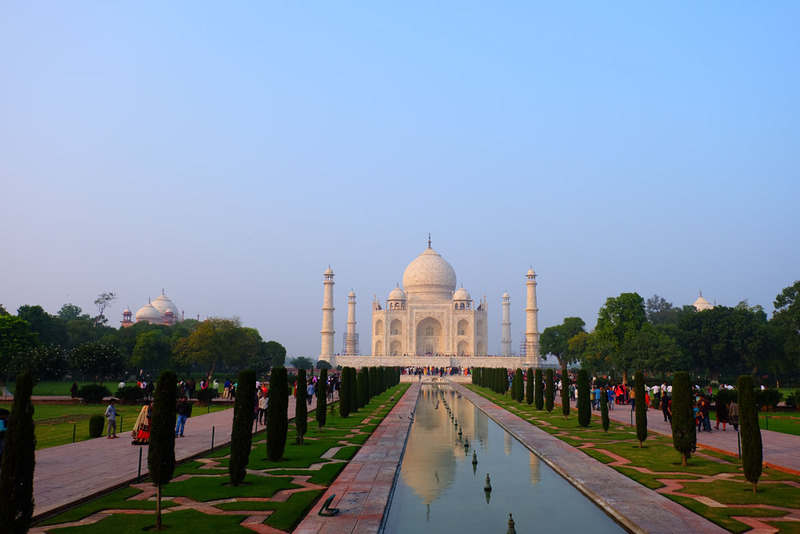 Agra is included on the Golden Triange tourist circuit and although the city doesn’t have much to offer other than the Taj Mahal and Agra Fort, it’s a part of the itinerary that obviously can’t be skipped. Agra isn’t only known for the Taj Mahal, Agra Fort is also definitely worth a visit. Agra Fort is a historical fort which served as the residence of the Mughal Dynasty until 1638 when the capital of India shifted from Agra to Delhi. 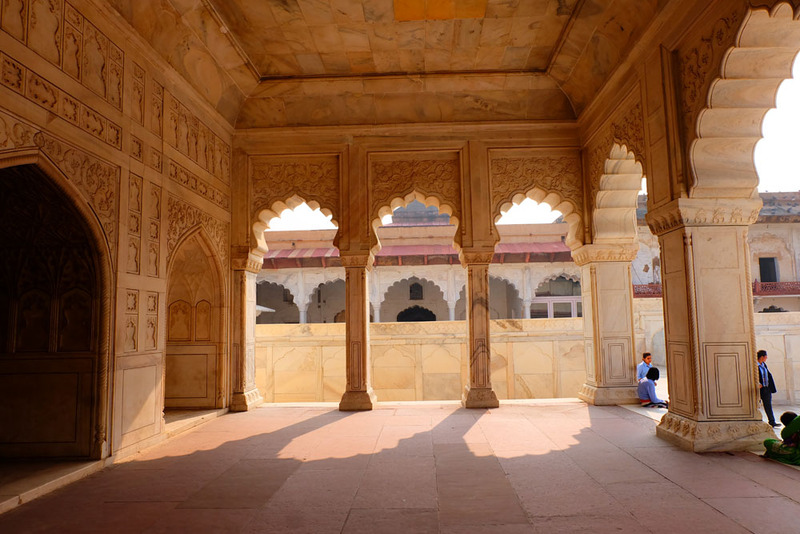 The fort is a UNESCO World Heritage site and sits only about 2.5 km from the Taj Mahal. This fortress made of red sandstone is absolutely stunning and sits within 2.5 km long enclosure walls. Another UNESCO World Heritage site and one that is on many peoples bucket lists. The Taj Mahal is an immense mausoleum built of white marble between 1631-1647 for Mughal emperor Shah Jahan in memory of his favourite wife. When viewing this mausoleum it’s hard to believe this was not built as a palace of some sort. However, when you visit, the most spectacular views are from the outside and although you can go inside (make sure to find the foreigners line to inside as it’s much shorter) it is tiny and less spectacular. Try getting in line before it opens in the morning to visit when there are less tourists! Now that you’ve seen some of the sites and soaked in the city life of India, it’s time to head for a break from the chaos. Orchha may seem like a random inclusion on this list because it’s a small rural town that many people probably have never heard of. The town only has a population of around 8,500 and is located along the Betwa River. To get there, you’ll need to take a train from Agra to Jhānsi which takes around 3.5 hours and falls among the price range of other train rides on this itinerary. 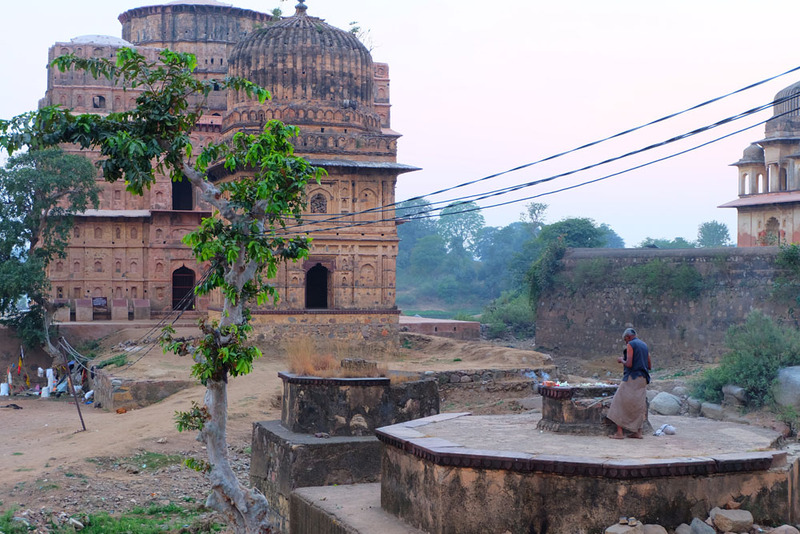 Jhānsi is located about a 30 minute drive from Orchha so when you arrive at the train station you’ll need to take a taxi which should only cost around $4 USD. I added Orchha to this list because India is an exhausting country, especially when you aren’t doing the beaches in the south, so by this point in your trip you’ll want some relaxation. Orchha was incredibly majestic, peaceful and a beautiful town rich with culture but much more laid back than Delhi or Jaipur. Since there isn’t much to do here, I recommend to only stay for a day, however, if you want more relaxation than chaos, you could stay for longer. 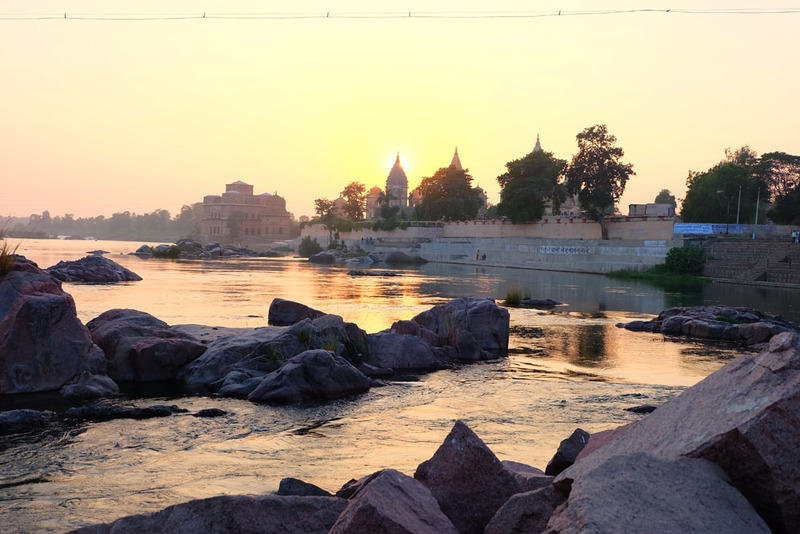 Watch the sunset: Walk to the bridge that crosses the Betwa River and watch the sunset behind the gorgeous historical buildings. Orchha Fort Complex: This complex houses a large number of ancient monuments that you can get lost in! They’re absolutely stunning and a must-do. Rafting: Head down the Betwa River on a raft to get the ultimate views of the gorgeous structures in Orchha from the water. Cooking class: I did a cooking class as part of the G Adventures tour I was on, however, Rajni, the young lady who hosted it in her house can be contacted on her Facebook here. Chhatris Cenotaphs: There are 14 memorials to the rulers of Orchha grouped along the river. They are built on the spot that royals were cremated and are beautiful in design. Looking for a place to stay? Orchha Resort was beautiful and located right on the river! Back to the chaos of India you go as you head from Orchha to Varanasi. Get ready for the long journey as this one is much longer than the other ones on this itinerary and will involve an overnight train. So if you are like me you are probably terrified by the words “overnight train in India”. I heard such horror stories about trains in India but it turns out they weren’t all that bad. However, it’s important that you know a few things: 1) the different classes of cars and make sure you pick the right one so you don’t have an uncomfortable journey and 2) What train you’re getting on and when because these trains don’t stop for long/they hardly stop at all. Here is a great guide on how to survive a sleeper train for further tips. So all aboard! Get on the sleeper train to Varanasi and settle in because you’ll be on the train for close to 13 hours (cost is around $14-$20 USD). Bring snacks, lots of water, ear plugs and get settled in for the evening. Although it sounds dreadful to be stuck on a train this long, with an open mind it really isn’t that bad. Also, Varanasi will be totally worth it! Varanasi is the holy city of India that sits on the banks of the Ganges. It is a major religious hub in India and is the holiest of the seven sacred cities in Hinduism and played an important role in the development of Buddhism. 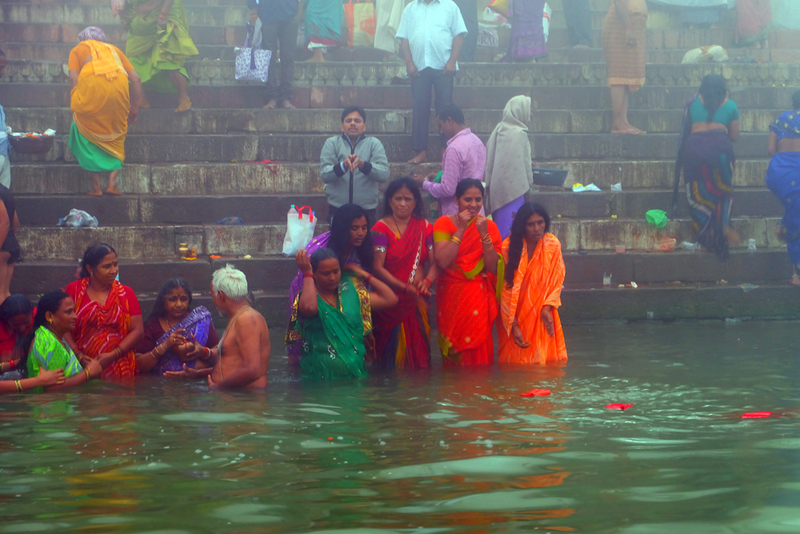 The Ganges are also home to several cremation sites. The water of the river is known to be holy and cleansing, so almost all Hindu’s wish to be cremated here when they pass away. This religious significance is what draws so many tourists from other parts of India and beyond to Varanasi. Visiting this holy city is an experience in itself and one that can’t be skipped on your India itinerary. 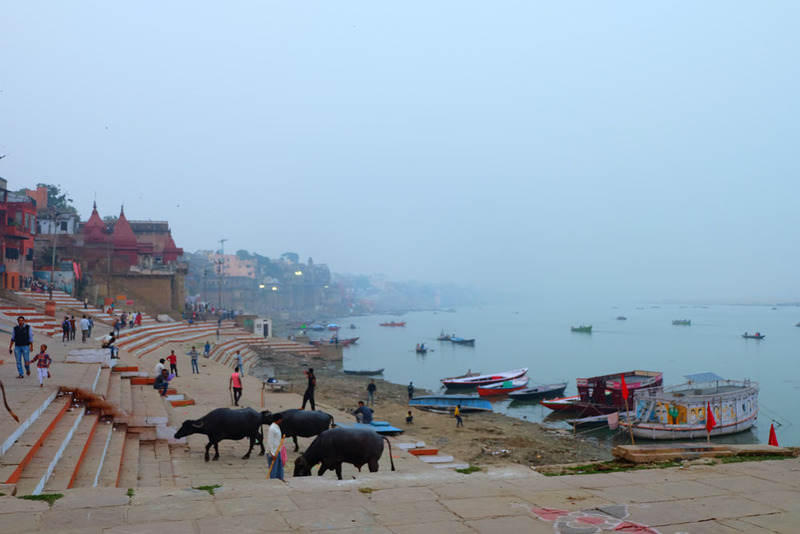 Explore the ghats: There are so many ghats that are each unique in Varanasi. Take some time getting lost in them. Take a boat ride: Rent a driver and a boat (make sure you barter) by the water to take you along the river past the ghats. We actually did three different boat rides. One at sunrise but it was too foggy for us to see anything so we did another one during the daylight, and then we ended up doing one at night to witness the prayer ceremony from the water (details below). Sit back and enjoy life on the Ganges as people cleanse themselves and pray, do their daily laundry or attend a cremation ceremony. Remember to be respectful and don’t take pictures at the cremation ghats as you can consider it like taking photos at a funeral. Hindu prayer ceremony: The evening prayer ceremony (aarti) happens every night along the Ganges and it’s unlike anything you’ll ever witness. The river will be lined with people dressed in colourful outfits, burning incense, creating music and chanting prayers. The best place to view the ceremony is by the water where boats will all tie up together to watch and pray. Alternatively, get there super early to get a spot close by to the action. Remember to be respectful as this isn’t a tourist attraction but a religious ceremony for most. Sarnath: 10km from Varanasi is one of the most recognized Buddhist pilgrimage centres. It’s said that its here where Lord Buddha preached his first sermon. For more things to do, check out this list. However, I found the best part exploring the city and ghats. The hotels near the river seem like cool places to stay, but they also dump all their waste, etc. into the river. Stay at an eco-friendly hotel away from the riverbank. This completes your whirlwind trip through Northern India. Either head back to Delhi to fly home or continue your journey to the south or to Nepal. Your trip will be overwhelming, it’ll challenge you as a traveller in ways you’ve never been challenged before but you’ll leave with a different perspective on life and the Indian culture. Enjoy!